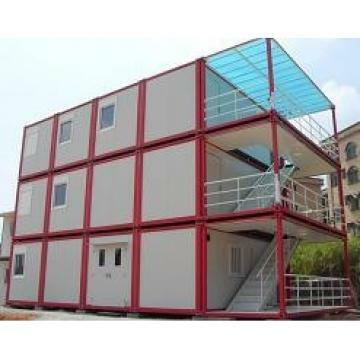 1.XGZ made series house is a kind of light steel structure modular house with the color steel sheets. 2.The steel structure makes the house resisting heavy wind of 100km/h and 7 grade earthquake. 3.Color steel sandwich panel has a good fire proof and heat insulation performance for the characteristic of the color steel sheet and polystyrene material. 4.All the components of the house are prefabricated before leaving the factory, produced according to requirement of customer. 5.The completely knockdown of the house components can save more space of the container and make the cost of house lower. 6.It is easy to assemble for the light steel structure. 7.The components of the house can be used repeat so the shelf life is over 30 years without any building garbage. 8.The waterproof system on the roof makes the house a good sealing effect. 9.A concrete square can meet the requirement of the foundation. 10.The mineral wool acoustic ceiling, cement ceiling, partition and laminated flooring accessories are optional for customer. 11.We can provide the service of installation, supervision and training by extra. 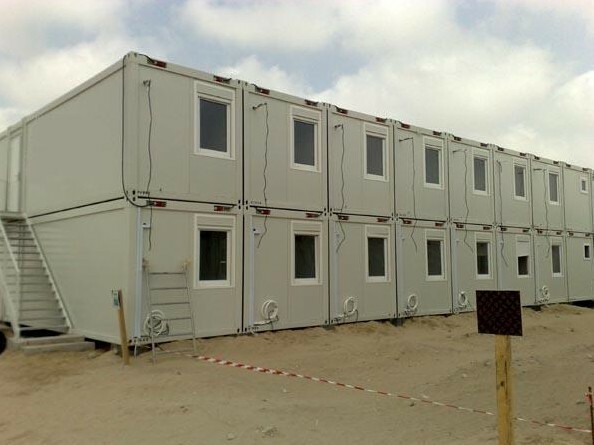 12.XGZ made series house has a low cost and good ability to assemble at site, so it can provide for temporary office, accommodation, entertainment and school room quickly and large quantity.